I got to thinking about this when someone recently said, “This must be so hard for you”. Unfortunately, this is a reoccurring theme. I have lost count of how many times we have heard this accompanied with the “sad eyes”. They were referring to Noah’s autism when he was being loud, pacing, and just being Noah. In fact, he was super happy! Perspective is needed. We are not victims of our life; we are a result of it. The bumps, bruises, successes and failures made me into the person I am today. I don’t see my son’s autism diagnosis as a sentence of despair, but rather one that has created a better understanding of people. Having a child with special needs made me a better father, husband, and person than I ever thought I could be. I am less selfish, more understanding not just of my son, but of others in general. I have expanded my mundane vocabulary by adding words like IEP, FAPE, Due Process, Insurance Mandate, ABA Therapy, Reinforcer, Preference Assessment and the like. I have made countless friends near and far that have enriched my family’s life with their honesty and humor. 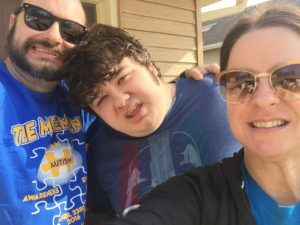 Before you start screaming about all the hard stuff autism families go through, our son’s autism isn’t a piece of cake. There are hygiene concerns, limited communication, challenging behaviors, so I get it. I am not saying that his autism can’t be hard and challenging at times, it will bring you to your knees emotionally and physically. It is also not to say that I don’t hope for amelioration of his pain, I do every day I pray that his pain is eased… every damn day. I long for the days where he doesn’t hit himself, melt down when the Wi-Fi goes down, or perseverate on his schedule, and hell yes, I want him to fully understand the conversations I have with him about bacon and music. So, before you think I am glossing over the pain, know I am living this life and it is not for the faint of heart, but I implore you don’t place your sorrow on our family, our lift is already heavy enough. Did you hear what I said? We are living – sometimes surviving, but nonetheless living. Our journey is made up of compassion, failure, success, joy, pain, despair, hope and so much more, but not pity or victimhood. Don’t feel sorry for us; instead pick up a needle and mend our tatter edges. The world is already pulling at the threads that hold us together. Most families will accept genuine help and compassion including ours, but pity is not welcomed in our house. We don’t have time to be victims. We have too much sh*t to get done. The next time you think, “I feel sorry for that family”, ask yourself “How does that help them?” Believe me, we have many things to accomplish to help our sons and daughters. Instead of feeling sorry, can you: call a legislator, offer care for date night, show compassion, an invitation to our children to a birthday party? How can you turn your sorrow into our collective action to change lives? I am not a victim. I don’t feel helpless to remedy or help our situation, but rather empowered to improve it. Don’t wish a different life upon me, I am grateful for the one I have been given to live.